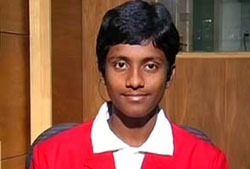 2011 - IIT National Topper from Andhra Pradesh! Kudos to Mr Pruthvi Tej ! The West Godavari District of Andhra Pradesh is on head lines! The Temple town of abode Lord Balaji, Dwaraka Tirumala is proud of Mr I Prithvi Tej! This is about Mr Immadi Prithvi Tej, Who is the 2011 - IIT National Topper from Andhra Pradesh; proud not only to the state but also to all Telugu people. According to Mr Prithvi Tej about his success; 8 to 10 hours daily systematic study, without compromise on his hobbies is main point to note. Not only he got maximum marks in his most favorite subject of Chemistry; but also no one could able to reach him! Through the year he studied only the syllabus and later six more months he has thoroughly reviewed the same. For grand tests – he studied IIT_JEE model papers back to front! He followed HC Varma’s “Concepts of Physics” and for more grip on subject, to enable to face objective type of answering, consulted BC Pandey’s book. Mr Prithvi’s ambition is to become an IAS officer, after completing Electrical Engineering in IIT- Mumbai. Mr Prithvi’s schooling till 2nd class at St Xavier School, 3rd class at CRR Public School, 4th – 6th De-Paul Convent near to Dwaraka Tirumala. He is the alumni of Viswabharati School, Gudivada for SSC and Sri Chaitanya IIT Academy, Vijayawada for Intermediate. Mr Prithvi Tej was honored by all his earlier studied institutions. A great honor by none other than District Collector, West Godavari, Mrs Vani Mohan hosted breakfast on this occasion and enquired how he has targeted the rank; an inspiration to all including her family members. Mr Prithvi Tej not only IIT topper, he is also AIEEE 7th ranker. Earlier to this achievement, he stood one of the two toppers from AP, among 5 candidates selected Nationwide for Physics Olympiad, recently conducted; where, 80 countries have competed with 44,000 entries. He shall be at Bangkok during 10th – 18th July for attending practical relating to this achievement on invitation; a great honor conferred! 10. IIT Entrance All India Top Ramkers Sri Chaitanya Students! !